When it comes to an outdoor kitchen or custom BBQ installation for your home in San Antonio, Texas, no one does it better than Creative Backyard Concepts. There are many different styles of outdoor kitchens available to you, so you want to be sure you design an outdoor kitchen that fits your needs aesthetically as well as practically. 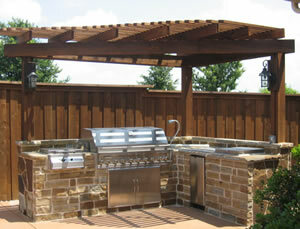 Creative Backyard Concepts can help you design the perfect outdoor kitchen that meets your needs. Below you will find helpful information about our outdoor kitchens services in Texas. Feel free to contact us with any questions. Looking for a roofing contractor in Waco, TX? 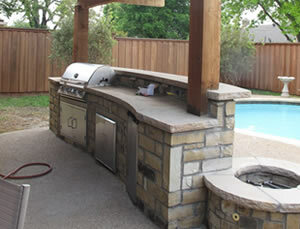 Creative Backyard Concepts is your complete source for custom designed outdoor kitchens and BBQ installations. From grilling gurus to masterful culinary artists, we will create a unique outdoor kitchen to satisfy all of your cooking needs. We take pride in thinking outside of the box and designing an imaginative haven for our clients and their needs. Tell us which cooking projects excite you, and we will design a unique outdoor kitchen plan that will facilitate those endeavors amidst the scenic backdrop of your backyard. Maybe you don't need a full blown outdoor kitchen but you love to barbecue and want to have a amazing space for those family barbecues and that amazing recipe you grill. With a custom BBQ installation you can increase a home's value, provide years of enjoyment and memorable meals for family an friends. Whether you have a large, medium or small yard, we can custom design and install a barbecue area you'll be proud of and thrilled to use. 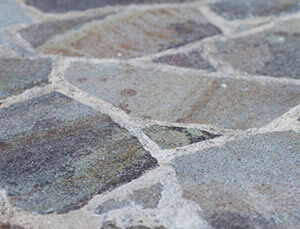 Flagstone patios are our specialty. Beware, all flagstone patios are not the same. Just about every landscaping company claims to lay flagstone, but very few do it correct. The beauty and elegance of natural stone is impossible to achieve with man made products. Our installers have spent years perfecting their techniques and take great pride in the finished product. We guide our customers through the stone selection process and give unsurpassed quality on the installation.